Local researcher discovers unique and ancient history at the mudflats near Millard Creek. The Eurocentric chronicles most of us learned in school told us ‘history began’ when the first white settlers came to our various regions. In that context, prostate the Comox Valley as a community ‘began’ somewhere about 1861, recipe when Governor James Douglas encouraged the establishment of farms in the region. Such a view is, here of course, untrue and—fortunately for future generations—there has been an attempt in recent years to present a much broader and more inclusive picture that doesn’t just tell the saga of the ‘white guys’. Not that the pioneering saga is in any way unimportant, but it is only part of the overall picture. To get the real kick-off date of our region, it’s more realistic to go back in time for at least a millennium, and arguably even earlier. For the tale of aboriginal culture in the area of Comox Bay goes back at least 1,000 years, according to Nancy Greene and her husband, David McGee. And they now have proof of that larger picture. For them an intense involvement with what we once were began with a few walks on the mudflats off Millard Creek, just south of the popular Courtenay Airpark Walk. Estuary country it is, with the flats originating from the volume of silt that has been deposited by the Courtenay River over the centuries. It’s a lush spot ecologically and in the days when the river was much more ‘alive’ and environmentally uncompromised than it has been in recent years, a veritable bounty of marine life, either in transit or resident, called it home. For Greene her change in perspective came about in 2002. At that time she had returned to school as a mature student and was working toward a degree in anthropology. Inspired, she wanted to get her scholastic quest wrapped around something original. Quite frankly, she found it, and she found it essentially in her own back yard. And what she found is something that has thrown conventional views of the Comox Valley’s history and pre-history asunder. Now, eight years later, a tremendous amount of painstaking research is coming to fruition. Research that has involved intensively scrutinizing what to the average stroller might be seen as a bunch of prosaic sticks in the mud. What Greene has come to realize is that those sticks have opened up a panoramic tale of a people who toiled and thrived in the Comox Valley long before it was a blip on the radar of the outer world. Living in the Comox Valley area, the duo had noticed the sticks before (you can see a lot of stakes when driving along the Dyke Road) and had paid them little heed. But then the moment-of-truth struck. These were not just random bits of wood, but they followed a pattern in a vast array, spreading out from the shore in parallel lines well into the flats. Parallel lines are not random—those sticks had been put there for a purpose. The irrefutable conclusion is that the stakes were part of what appears to be the most extensive and sophisticated pre-historic fishing operation to be found in Canada to date. While the traps are long gone, the stakes—to the tune of 150,000 or more— bear testament to the extensive nature of the site. How many more stakes is pure conjecture since, as they attest, siltification over the centuries may have covered over further layers of stakes well beneath the surface. 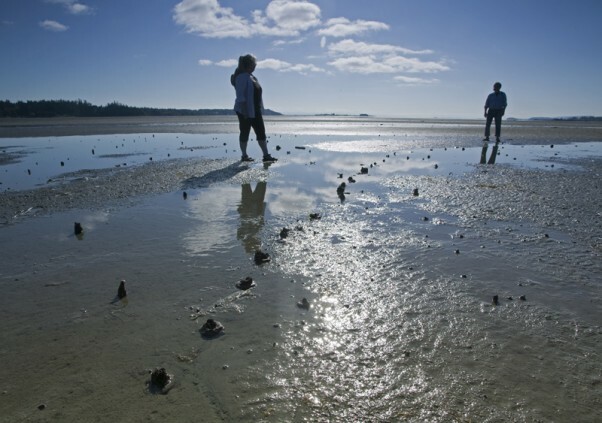 A walk on the tidal flats, once the patterns are pointed out is, in a word, dazzling. A huge sweeping pattern encompassing a sizeable expanse immediately indicates the extent. Once that reality was realized, the archeology student realized her true quest was before her, and she attests the revelation was a powerful one for her. And the traps themselves in their days of use were not some sort of primitive or rudimentary constructions. They were obviously designed to harness the tidal movements of the estuary in order to apprehend the fish—be those either salmon or herring, both of which there was a plenitude of in the days before the river underwent the challenges of dyking and dredging. 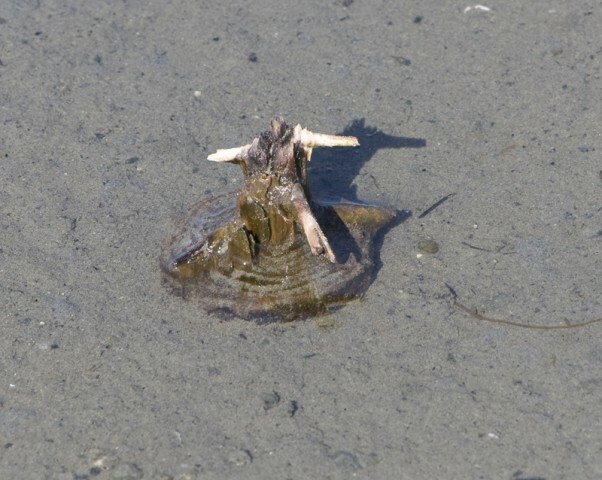 As of March of this year locations of approximately 200 trap feature sites, each representing as many as a thousand upright wood stakes, have been recorded on the tideflat. To precisely map the trap features, coordinates of nearly 14,000 individual stakes were recorded at 19 of the sites, Greene noted in a report published this past spring. The tidal traps, as illustrated, were amazingly sophisticated and cast an entirely new light on our preconceptions of this earlier culture. Extensively distributed on the tideflat, the traps show a network of fish apprehension that was likely “industrial size in capacity,” McGee says. From a conservation perspective, Greene says, they realized the traps were not environmentally negative. The aboriginal fishers appreciated the virtues of conservation of the species, be they salmon or herring. What was found—and this was long before such considerations became serious concerns—was what appears to have been a sustainable way of fishing. As the traps depended on the tides to catch fish, they only operated 50 per cent of the time. They only caught fish on a falling tide. For salmon, that assured that a lot of fish could swim past the traps on a rising tide and continue on up the river to spawn. “The way that the traps functioned to catch fish indicates that early First Nations had a detailed knowledge of nature,” she says. Considering that the traps are located close to salmon bearing streams, the realization that the traps weren’t used exclusively for salmon also came as a revelation to Greene and McGee. So, what actually caught the fish? These were times well before the use of modern fishnets. Greene says archeologists have found remnants of lattice panels buried in the mud at other intertidal sites along the Northwest Coast. The panels were built by weaving long pieces of split wood together—much as is used in basketry—which would be strung between the stakes. Water could pass through the openings in the panels, but not the fish. As for the stakes themselves, the majority are either hemlock or Douglas fir, both of which grow in abundance in the Comox Valley. McGee points out that First Nations culture was a “wood culture” and that virtually everything used was gleaned from the abundant forests of the day. So, the task ahead of her wasn’t one for the faint-of-heart. Fortunately for the entire community, aboriginal and otherwise, Greene is not a person to shrink from what would seem like a daunting task. After all, there was no research funding, no equipment, and she wasn’t in a position at the time to be deemed a full-fledged archeologist. That considered, she just went ahead and did it. What she did have, however, was a community at her disposal, many members of whom were excited by what she was attempting. “People were really excited to come out on the tideflat and help with the mapping. One connection that was arguably the most significant of all, since the project involved early aboriginal peoples, was the vital tie in with the Kíomoks Band. Early on, First Nations recognized the value of what had been found and they provided funding for the first Carbon-14 dating, a very costly process. What it meant to them is that they, as a peoples, situated on the edge of the traps are a continuation of a society at least a millennium old, and likely older than that. Are there other equivalent fish trap sites in our coastal areas? “Possibly,” Greene says. “Archaeologists are looking for other sites right now along the coast, but I haven’t heard that anything has been found yet that rivals the extensive distribution and sophistication of the prehistoric fishery at Comox Bay. The process of mapping, says Greene and McGee, was a grueling one that involved accounting for “every single stake.” Community involvement was an invaluable help and a team of volunteers joined them in slogging along the flats at low tide and marking the spots. Greene says it’s important for contemporary Valley residents to realize that the estuary was considerably different during the centuries in question. What has brought about the change is dredging and dyking of the Courtenay River channel. While dredging has declined in recent years due to the shutting down of the sawmill, it was a regular feature in the river for decades so that tugs and barges could ply the lower reaches of the Courtenay River. Currently Greene and McGee, along with Comox Valley Regional District Area B director Jim Gillis and retired University of Toronto biology professor emeritus Paul Horgen (who are strong supporters of the project) have been making the rounds of municipal councils in hopes of gaining funding. In that regard the ‘Stick in the Mud Club’ was born. Far from finding the frivolous reference offensive, Greene and McGee find it amusing and one that might capture the imagination of the community. So far they have attracted some welcome response. The reference, Greene says, reflects a sense of humor about what really amounts to a whole lot of sticks in the mud. Nobody wants to be a stick in the mud, but if you support the research, you get the title of being an official ‘Stick in the Mud’, something with a certain amount of oddball prestige attached to it. Recently Gillis, in a presentation to Courtenay Council, said the most urgent need was to have organizations or individuals offer $500 to pay for the carbon dating of 40 to 50 stakes. The stakes to be dated, he said, would be selected from different parts of the estuary to get a clearer picture of the age of the traps. In return, the donors would become members of the ‘Club’. In return for the contribution each member of the Club will get a certificate designed by First Nations artist Andy Everson, commemorating their participation. The certificate will include the sponsor’s name and information about the particular stake the member has chosen to sponsor, including its age, species of wood, type of fish trap it was used for and the GPS location in the estuary from which the stake was excavated. Greene says that the analyses of the additional 46 stakes will broaden her understanding of the age and size of the fishery and how the traps functioned. Ultimately Greene’s full report will be submitted to the provincial government and she will publish the results of the research in a peer-reviewed archeological journal. And finally, if there is enough community support, the hope is that Comox Bay will be designated a national historic site.